Kitchens Dungannon - Easy kitchen updates to help transform your room. So you’re looking to give your kitchen an update, but you don’t want to start from scratch. And that’s understandable! 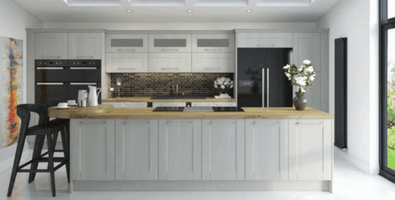 Creating a brand new kitchen can be expensive, so we’ve come up with some tips that will help you spruce up your existing kitchens Dungannon. If you want to add some colour to your kitchen, why not try a bright coloured kitchen appliance? Retro appliances come in a whole rainbow, with more and more kitchen companies are jumping on the bandwagon and creating their appliances in a range of colourways. Or you could go the complete opposite way; tap into the expansion of black kitchen appliances and accessories. Why not get rid of the usual silver boring tap, and have a matte black replacement? It works in pretty much every style of kitchen around! Tiles are a simple yet effective way to give your kitchen a shakeup! Not only are they easy to clean, you can create some funky patterns and designs with a whole host of tiles. Why not create a chevron motif or use oversized tiles to make a statement? If you looking for increased storage, why not create your own peg rails or shelving? It’s simple enough to do with scrap pieces of material, but it gives your kitchen a rustic and quirky feel. It’s also an easy way of storing things but still knowing exactly where you have stored things! If you have a creative flair, why not add in a blackboard feature wall? All you need is a tin of blackboard paint and some chalk! It’s also a simple way to keep your little ones pre-occupied while you’re busy cooking. We hope that these kitchen tips have given you some inspiration to go out and update your own kitchen. But don’t forget; if you ever need any help, our design experts are always on hand for any of your kitchens Dungannon issues! Bedrooms from Starplan – have you visited any of our TEN stores yet? Fitted Bedrooms – how to create the perfect shared bedroom.